Spring has “sprung” and the urge to get dirt under one’s fingernails is uncontrollable! 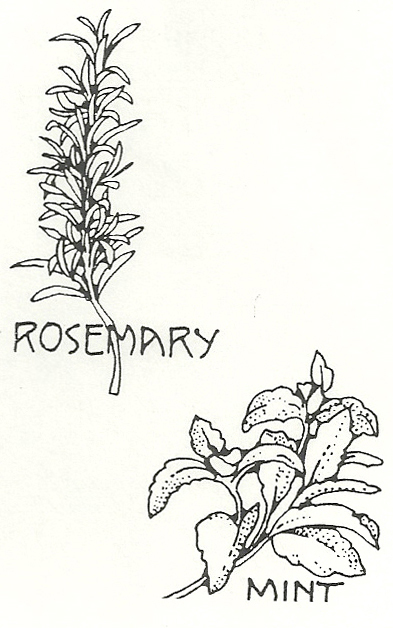 Oh, to have a backyard filled with the scents of lavendar, lemon thyme, mints and sages. If you don’t have a yard, the “in thing "now is gardening in large pots, so either way, everyone can enjoy growing fresh herbs. Herb growers are constantly working toward new varieties and to re-introduce old favorites. The most discouraging factor of the new varieties is the flavor as most are for decorative purposes only. Making a comeback after many years is black loveage — sometimes called horse parsley. The 4 foot high frennise has glossy green foilage with yellow flowers and black seeds with a celery like flavor. Coming to us from India are two new varieties of garlic chives. One, a yellow flower blooming in late June and the other, a mauve colored bloom in July. Also available from France is the small leafed sorrel known as“petite-oseille” by the French. Numerous seed catalogs are out and all advertising great deals on herb seeds and herb plants. Maybe the best advise is to remember it usually freezes in May, so don’t get too anxious. The local nurseries handle a variety of herb plants and if there is some special herb you want, call me (801-973-7875), and l‘ll help you locate what you want. Beware of any Tarragon seeds ~ just French Tarragon plants. Also some of the fancy basils are not as good as they sound. Lemon Basil is a nice extra. Sage ~ Pineapple is nice.